This Post is Probably TMI. Period. I'm going to share a secret with you, friends. A secret so embarrassing that I kept it from even my closest friends from fifth grade until, like, college. And, just so's you have fair warning, it's a feminine-type secret. Involving girl things. Like periods. So if you weren't down with my gray hoodie post, I suggest you click on over to something a little less ... frank. Oh yes I did. The perm. The bangs. The brows. The Spongebob Squarepants teeth. 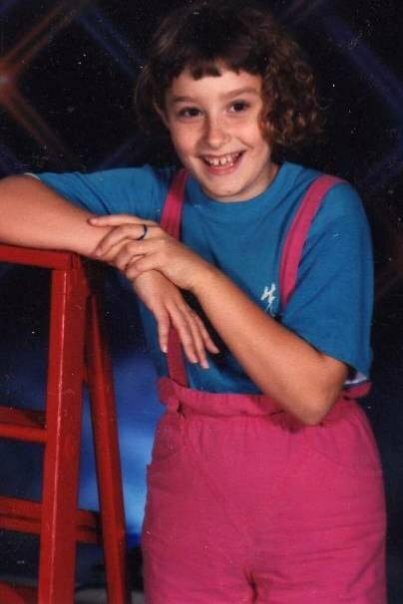 The hot pink suspenders. Yes, my friends, I was actually that cool. Anyway, I was proudly sporting this same fashionable look when my fifth grade teacher, Mrs. Haxel, announced that we were going to watch a special film: one just for the ladies. Giggling the entire time, the fifth-grade girls were segregated into a darkened room. We watched with a combination of horror and delight as the actress who'd once played Little Orphan Annie told us of the impending changes in our bodies. How we'd soon become women. Turns out, I took the "soon" part a bit too literally. Because when one week passed after the movie, and then another, and I still hadn't started my period, I began to freak out. What's worse, one of my friends actually did start hers within just a few days after watching the film. I thought that's what was supposed to happen. I thought that watching the movie meant that I was going to get my period, like, immediately. 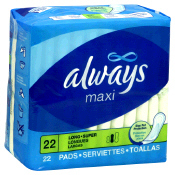 Why else would we have gotten the free sample of maxi-pads? I was usually a smart kid, but when it came to feminine matters? Notsomuch. It wasn't that my mom wouldn't have filled me in if I'd asked, but I didn't. I was far too embarrassed. And she didn't exactly volunteer the information; she was probably too busy being a single mom working two jobs and taking classes (and secretly hoping that Little Orphan Annie would tell me all I'd need to know). I wasn't sure what was wrong with me. But what I did know is that, if I told my mom, she'd probably take me to the doctor. And the only thing more embarrassing than telling my mom would be telling my pediatrician, the man who had cured my ear infections and upset stomachs since I was a toddler. To avoid this painfully embarrassing scenario, I figured, there was only one thing I could do: lie about it. So before my mom could confront me, demanding to know why I had watched the film and still hadn't started my period like a normal ten-year-old girl (which I just knew was going to happen any day), I barricaded myself into my bedroom with my sample pack of pads and a bottle of nail polish. It was a reddish-brown shade called Rich Russet. I painstakingly dabbed a bit of nail polish in the center of each pad. I had no idea what a used maxi-pad actually looked like, but I used my imagination and dribbled the polish accordingly. When I was finished, I had a small stack of "used" pads. They would provide the "proof," at least in my mind, that would keep me from being subjected to the embarrassing truth. For the final touch, I dribbled polish into the crotch of a pair of underwear. It was those underwear that I showed to my mom, telling her I'd started my period. Only I didn't show her show her ... it was more like a little flash. That way she couldn't examine it close enough to tell it wasn't blood, only Rich Russet nail polish. She bought me a box of pads. Success! I fully immersed myself in the role of period-having-fifth-grader. I told my friends I'd started so that they, too, would think I was normal. And every month, like clockwork, I'd periodically (hehe, no pun intended) crumple a few nail-polished pads into the bathroom trash to perpetuate my lie. I was mortified. WAY too embarrassed to ask my mom about it. I knew she'd found them, but she didn't say anything and neither did I. I figured that either she had found me out, or she thought I was some dirty-pad-hoarding freakazoid. Either way, the jig was up, and my faux-period period was over. I was actually relieved. And to finally wash my hands of the lie once and for all, I told my friends that I hadn't started after all. Although to avoid looking like a total liar, I stupidly told them that I thought I'd started ... but it was hemmorhoids. They believed me, but I got mercilessly teased well into middle school. I suppose it serves me right. ... when I was in fifth grade. LOL, I SO remember all this! I knew what was up, and don't know why I didn't say anything, except to spare you the embarassment. ;o) I remember being both relieved and sad when I found your "stash" under the beanbag chair. Relieved because you were so young, and sad that you thought the whole issue was THAT important. Anyway, we both survived and being female hasn't killed either of us! I had my first visit from Aunt Flo around 13 and since have found great ways to keep her away. Currently I am an IUD user and I haven't seen her for about 5 years! I'm so glad I don't have girls because that means I won't have to explain the monthly woes of being a woman. Not TMI, but just enough. Thanks for reminding me that no one is normal, we are all just doing our best to go with the flow whenever we can. That is HILARIOUS!!!!! OMG, I can't believe you faked it for that long!!!! That was hilarious and AWESOME in it's finest form! And I'm just talkin about your picture there. No, no, I kid! I love pics from our youth. It just makes us all feel better for how well we turned out, in spite of our tragic taste and hair. Anyway, LOVED this story. It was soo freaking funny. Amazing that you carried on for so long. I started between 6th and 7th grade when I was 11. But, thankfully, I never had a regular period, so I wasn't too bogged down with the ick of it all. Being a girl is so awesome. Ick. That was too funny! I so didn't want to get my period. I still wish I didn't have the damn thing. no you didn't! a c k! mortifying! That's so funny! It's awesome to hear embarassing stories because we all have them too! That is too funny! The nail polish really cracked me up. I'd say you were very creative, I wouldn't have thought of that! Isn't it weird that we actually wanted our period back then? Oh...if only we knew! Haha! I remember watching that film. I think it's funny that you actually remember the actual name of the nail polish. haha... this is hilarious. The things we do to fit in. I have no recollection of becoming a woman. But, I remember, like, nothing, so that's not really surprising. I must have been dropped on my head as a child. Oh my that is effin hilarious!!!!!! Also, hello I'm a new follower! Your blog makes me laugh! Thanks! Haha I just came here to post the same link to that video! There's a Whore at the Door! Tag, You Should've Been "It"